Querying by Distance in MySQL | Sharp Innovations Blog | Sharp Innovations, Inc. Your only asset is a database table containing all possible locations with columns specifying latitude and longitude. 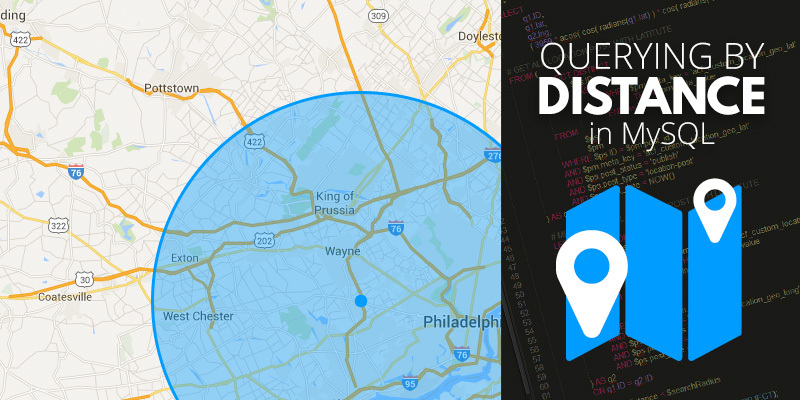 When the user submits their location, you’ll likely utilize the Google Maps API to retrieve the coordinates from an address, which you can then use to compare against your database records. Conceptually, it’s simple. Query your table and do a little bit of math, and you’ll have your result set. However, if you’re like me, maybe spherical trigonometry isn’t in your area of expertise, and you need to turn to someone else for a drop-in solution. Well, here you go! In addition to the locations table, let’s select a custom value called “distance”, which is the calculated distance between the user-submitted location and the location of the current record. The following mathematical sorcery is the Flat Earth Society’s worst nightmare. Query data from the locations table, and give it the alias “loc”. Return only those records where the values of longitude are within a certain range, performing more wizardry that considers the curvature of the earth. Also return only those records where the values of latitude are within a certain range. Consider only those records with a distance value that is lower than the one you specified. This is very important to keep your query as light as possible. Finally, to maintain some semblance of efficiency, limit your result set. It is important to note that this is, by nature, a very heavy and inefficient query. It becomes exponentially slower as you increase the value of $dist, so I’d keep a nice sensible cap on both that value and LIMIT to keep things speedy. If your database table is burgeoning with locations and you run a reasonably high-traffic web site, you’re going to want to strongly consider implementing a caching solution that helps mitigate the load. We hope you find this bit of logic useful!